Kealopiko sells Hilo 'Ia A Pa'a, a moon journal for recording observations. If you look up at the sky tonight, you’ll notice a new moon. According to the Hawaiian Moon calendar, this first phase is called Hilo – which means a twisted thread of light. In the past, Hawaiians used the moon and its different phases to track time. Now a group of people are using digital tools to try and resurrect this traditional practice. HPR’s Molly Solomon has more. 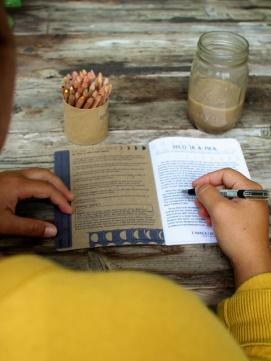 Find out more information about the Moon Phase Project or click here to purchase a Moon Phase Journal from Kealopiko. Tag your own posts tracking the moon by using the hashtag, #hiloiaapaa. If you started the New Year with a diet resolution, it may have already fallen by the wayside. Not so for three seniors at Kamehameha Schools. They’re changing the way they eat with a uniquely Hawaiian twist: a 90-day poi diet. And as HPR’s Molly Solomon reports, they’re documenting their journey in a new film that hopes to raise awareness of Hawaii’s starchy staple. This Sunday, music, chant, theatre, food, and free tours of ‘Iolani Palace are planned for the 175th birthday celebration of Hawai’i’s Queen Lili’uokalani. Recent historical research is shedding new light on events of her reign. HPR’s Noe Tanigawa reports.